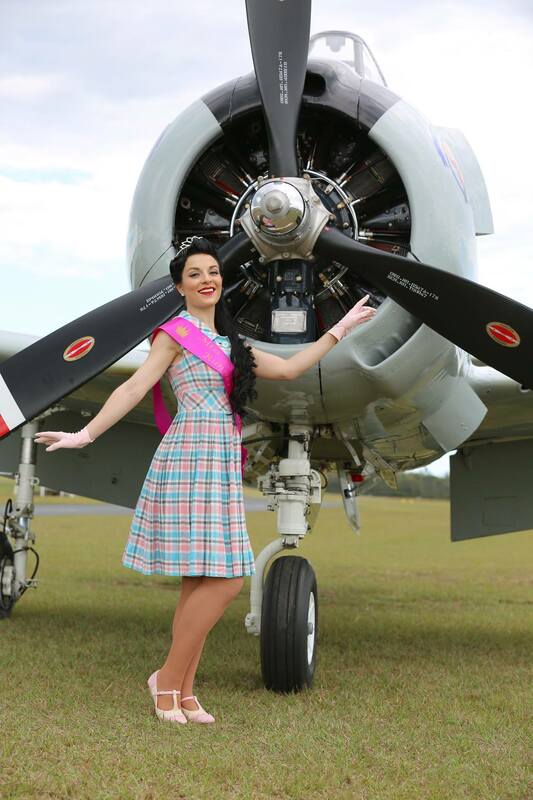 I was excited to be a part of the second annual Miss Wings and Wheels Pinup Contest held at the Caboolture Warplane and Flight Heritage Museum on September 6 2015. One of the things that excited me the most about the contest, was the freedom to get creative with the”My Inspiration” category. 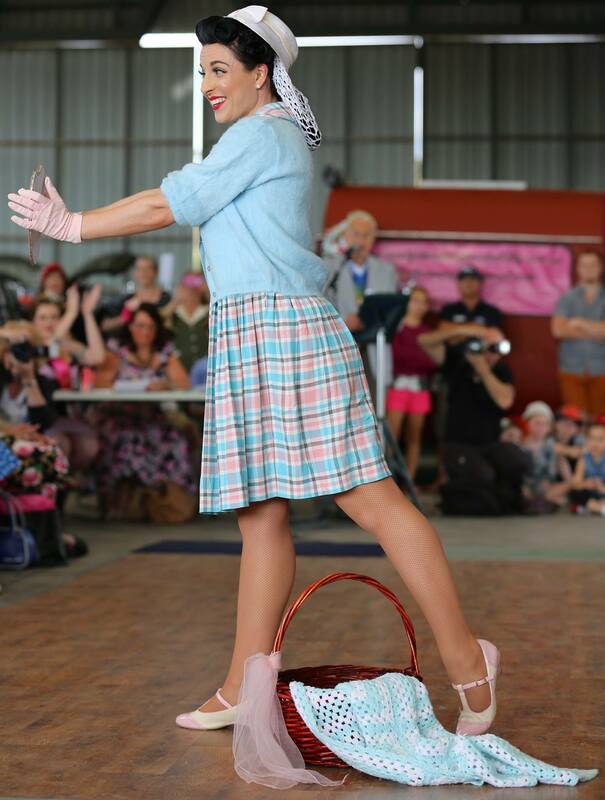 The idea of this category was to allow all of the entrants to show off one of their vintage/pinup inspirations or idols…and I knew exactly who I wanted to be for the day! 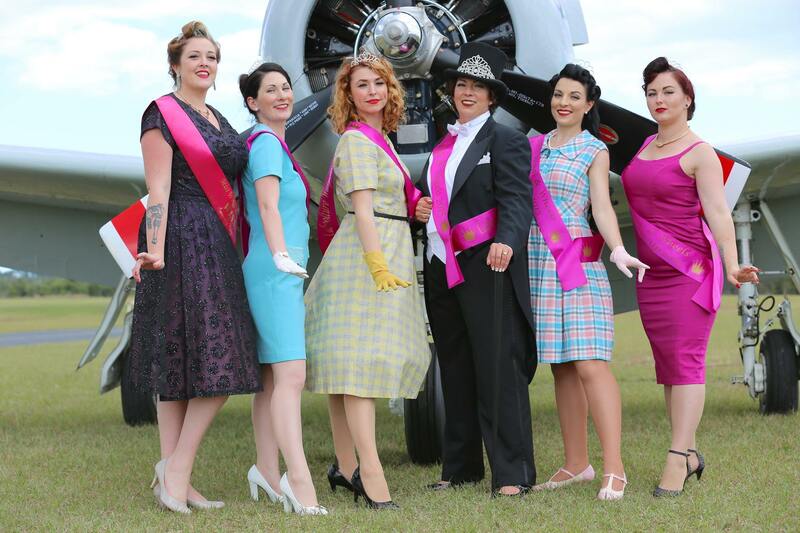 Miss Wings and Wheels entrants were chosen on a first in basis and there ended up being quite a large number of lovely ladies involved. The more the merrier I say! It was great to have the opportunity to catch up with some old friends and make some new ones. Despite being fairly buggered from the busy months preceding the event, I wound up really enjoying the day and not really wanting to go home! 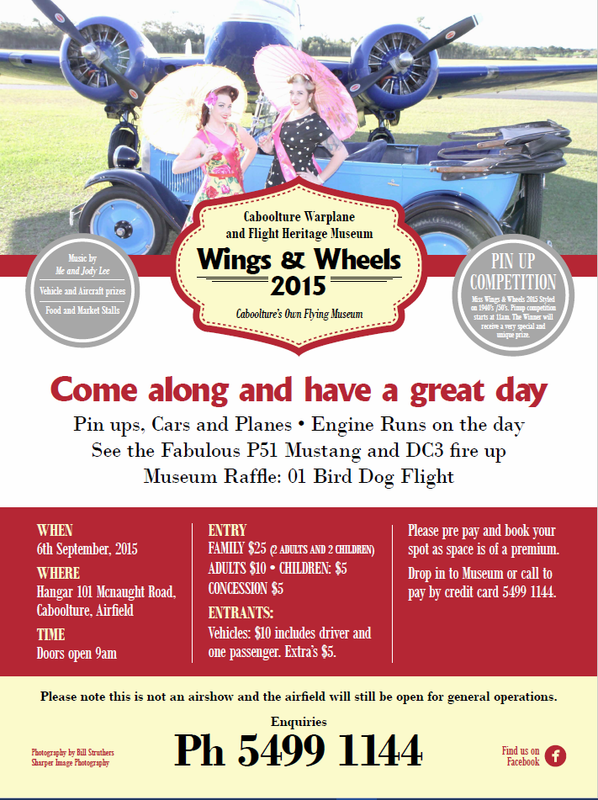 We met at the hanger early on Sunday morning and prepared for our daywear round. There were a few nervous first timer pinups among us and I must say, I just love seeing the juxtaposition of thoughts and emotions before and after going on stage! Such a contrast and one of many reasons I just love being a part of events like this. It’s such a thrill to be surrounded by women who are challenging, empowering and surprising themselves. For my daywear, I wore a cute vintage number I have picked up at Greazefest in August. 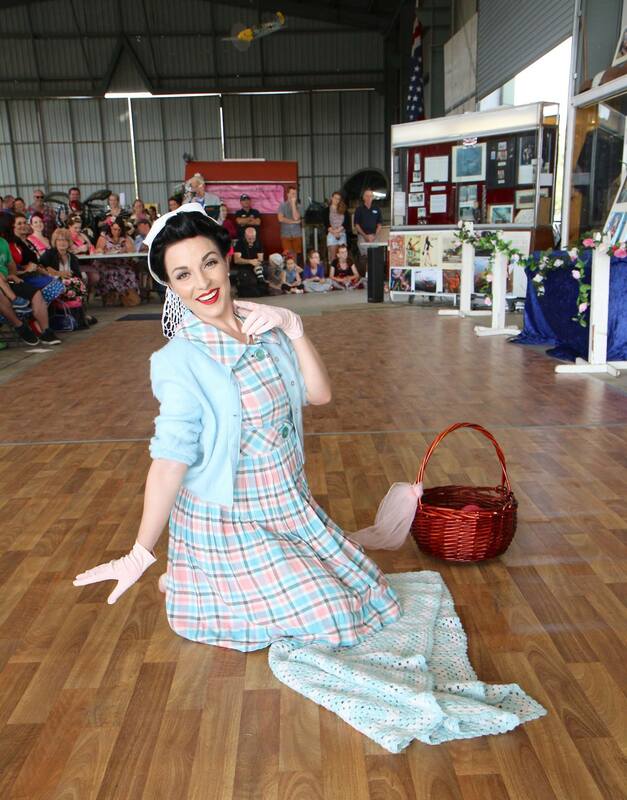 I carried the pale pink and blue theme through to my props and accessories and had a cute little pastel pinup picnic thing going on. It was lots of fun! A quick outfit change and we were ready to hit the stage again. This time, for the inspiration round. 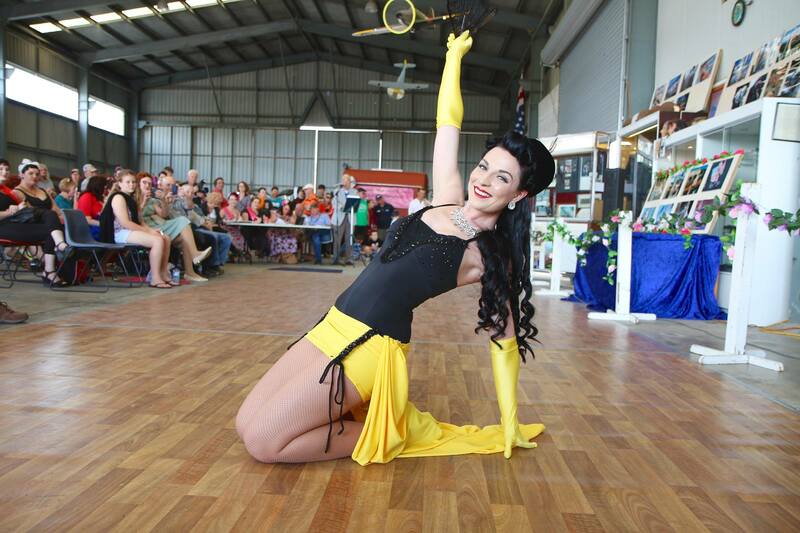 I had drawn inspiration from one of my favourite 50s ladies: Ann Miller! “Ann Miller was known for her performances in Hollywood musicals of the 40s and 50s. A true triple threat, she could dance, sing and act, and she did so with the utmost beauty and style. I made my outfit based on a costume Ann herself wore in the musical Easter Parade (1948). 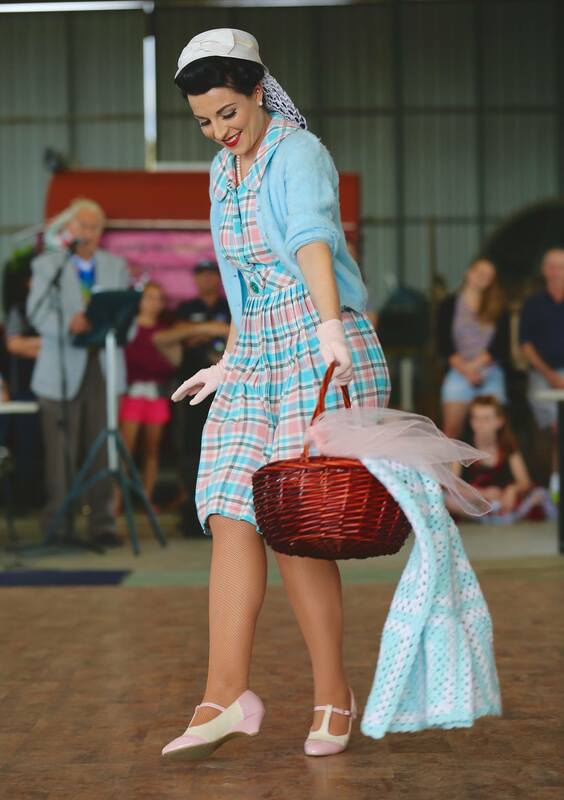 I threw in a few impromptu taps in my tap shoes to surprise the audience and truly had a ball pretending to be a glam film star. Before we knew it we were back out to hear the judges picks and I was both surprised and thrilled to hear my name called for 1st runner up. I had the pleasure of standing alongside 2nd runner up Ivy Dynamite and winner Terina Smith. The beautiful Miss Velvet Crush took out best Daywear and Miss Foxy Rocket took the title of best Inspiration (in THE MOST amazing gown ever!). All in all, it was a really enjoyable day out with a bunch of lovely ladies!